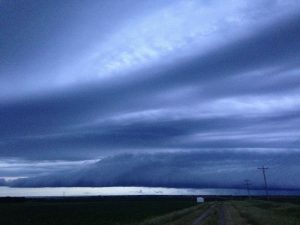 After travelling most of the previous day we knew a potent line of Storms currently in NW South Dakota would make it to Mitchell at Daybreak so it was an early 515am wake up and head out to the approaching Storms. The Sunrise in the east with the storm approaching from the west did not dissapoint. 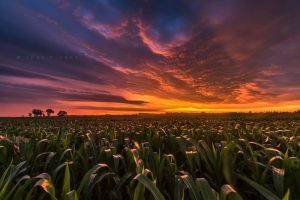 Some lovely colours of the Corn Field were on offer and John Finney captured some stunning pictures once again. Today was being billed as the big day of June for quite some time, A Day 2 Moderate Risk but by the time we had woken up this had been downgraded to an Enhanced Risk already. Upon looking at Surface Obs and Vis Sat this Risk was rapidly going downhill with an overnight MCS pushing the effective outflow much further south, in fact it was approaching Lubbock by 18z. All that was left was Upslope flow into the Foothills of Extreme Southern Colorado and the Raton Mesa area to give us some chasing. The 20z Outlook put a further nail in the coffin with the 5% Tornado risk being downgraded to a 2%. We left Lamar and had lunch in Springfield before heading west to a growing storm near Kim. 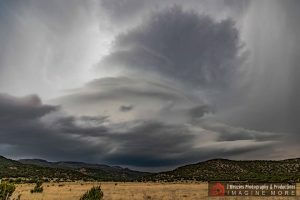 This Storm soon died but our attention was then focused to a very nice Supercell heading SE from Trinidad into New Mexico. 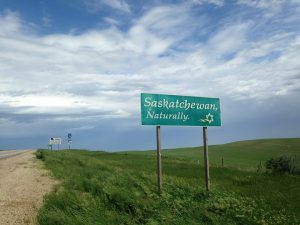 We headed south from Kim and stopped just North of Brandon to see some pretty stunning structure. 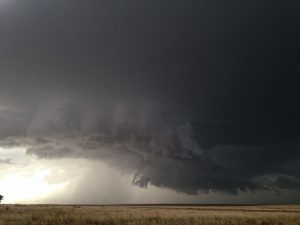 Around this time the Volocities tightened up quite a bit and reports were coming in of a Wedge Tornado on the ground to our West, but from our vantage point it was just a very low hanging wall cloud hanging on the Mesa. 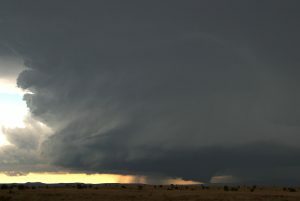 We continued South and watched some really nice Cg Lightning with Quarter Sized Hail falling around us North of Folsom. 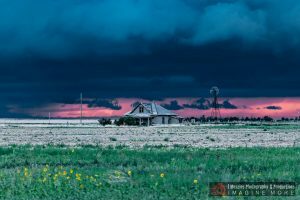 After this the Storms fell apart and we headed east towards our Overnight stay of Guymon but did stop 1 more time for some Lightning and Art Opps. Changeover day and another Risk day this time South and East from Denver with a small 2% Tornado Risk. 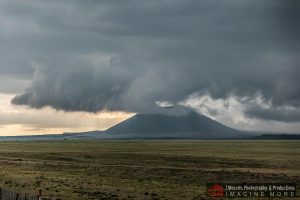 Supercells were ongoing when we got away from the Airport around 3pm and it wasnt long before we connected with a Storm South West of Limon. 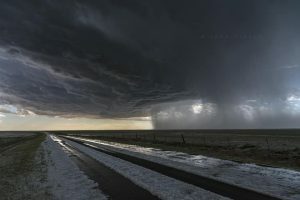 There was another Supercell that had gone through the area earlier which had dumped lot of Hail about 3″ Deep on the roadway which made it look like a winters scene. The Storm started to structure up and we started to take Quarter Sized Hail near Karval. When we got in front of the Storm and looked back some Impressive Hail Fog was rolling out the back of the Storm to our north. Started today in Fort Morgan with a very broad 5% Tornado area and a massive Enhanced Risk that covered Colorado, Kansas, Oklahoma and Texas. Overnight Models were keen on very early initiation in 2 South-Eastward Moving Bands. The trick today would be to get onto something that was Supercellular before everything grew upscale from congealing coldpools. My Inital target was Lamar for around 3pm so we set off south for a quick lunch in Limon. Along the way and at 1030am a High Based Supercell had already gone Severe just to our West, we could not resist the opportunity to take a few snaps before continuing our journey South. Even the Iphone Pano came out really well. 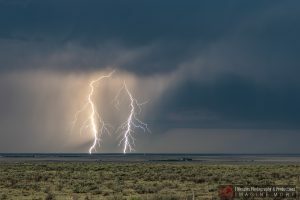 Our first Storm we intercepted was NE Of Pueblo, it briefly looked very nice but then took some time organising, we ploughed on and core punched a messy line of storms near Sheridan Lake. From there we turned South along Highway 385 to a Storm that was acting very strangely and had stalled near Bristol. The only way through was through the Hail Core and here we took some large Ping Pong and Tennis Ball sized Hail, we lost 1 windshield in the process. 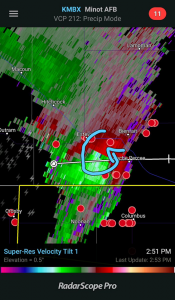 When we stopped South East of the Storm it really started to wrap up and insane fast rotation and rapid rising motion was noted to our North, this moved over us and the Storm started to form a hook, it wasnt long before it became Tornado Warned. How this storm did not produce a Tornado is beyond me. We continued East along dirt roads into Kansas and watched the Storm Cycle up and Down, West of Syracuse it once again gained strong rotation and the Wall Cloud was almost dragging the floor but once again it did not produce, I can only think weak inflow surface winds were stopping a bonafide Tornado producer today. 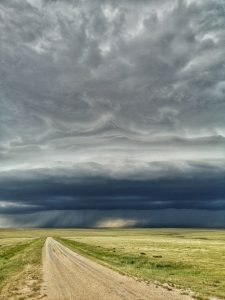 Knowing this was the last day before Changeover in Denver tomorrow we had to sadly leave the Storms and head back towards Burlington for the night, the drive back was stunning though with the setting sun to our west and a sky full of Mammatus to our East. A great end to a great Tour 4. 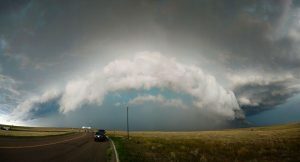 After travelling from Burlington to Cheyenne on Wednesday we took a gamble on a few storms occuring over the Laramie Divide today. HRRR was quite bullish on a Supercell or two occuring as winds swung back easterly just in time before diurnal heating waned around the 00z point. We had lunch in Laramie and watched cumulus trying to develop, around 430pm the first signs of something more substantial started to occur and we had a decent storm initiating around 15 miles to our west. Some great Cg bolts were noted, we headed back east over the Pass along towards a point just east of Cheyenne and noted some lovely LP Structure. The Hail also increased to levels that made this Storm go Severe Warned at this time. We noted a Left/Right Split around the time the picture was take above and followed briefly into the Hail core of the Northern Storm to pick up some stones which were mostly Quarter Sized. We then headed back South towards Carpenter to watch some stunning cloudscapes from the west of the storms. Finally Stopping near Stoneham as the setting sun cast a shadow on the dying storms. We awoke today with an Enhanced Risk and a 5% Tornado Risk in Colorado and Kansas. Morning models showed Colorado as the place to be so it was up and out at 8am from Columbus (NE) and a 350 miles slog west along Interstate 80 to my target area of Fort Morgan. Storms would erupt early today around 1pm so we needed to get west fast. And sure enough once we got to the business end of the drive 3 Supercells were lined up in front of us. The middle one was Tornado warned and we could see why when it came into view. 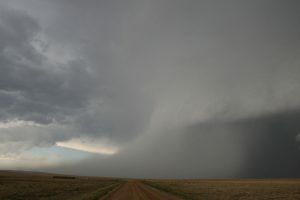 An amazing Structures Classic Supercell was sat near I76 South West of Fort Morgan. 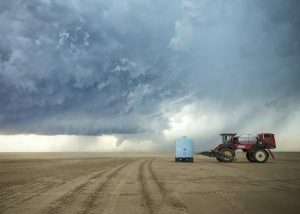 We took a south dirt road and watched this amazing storm rotate in front of us. 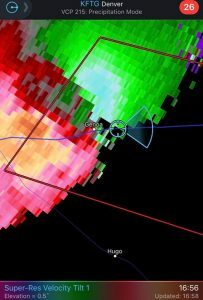 The radar at this time took on an almost classic hook and winds were screaming into the storm at 40mph sustained. 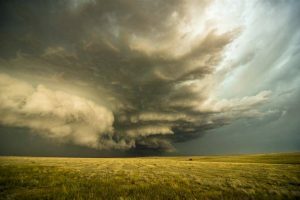 The Storm was wrapping up quickly and it would not be long before a Tornado was going to happen. 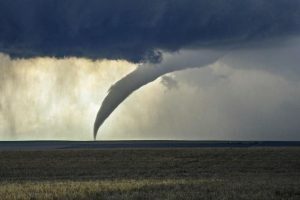 The Tornado was on the ground between Pleasant Valley and Keenesburg for about 7 minutes before roping out. 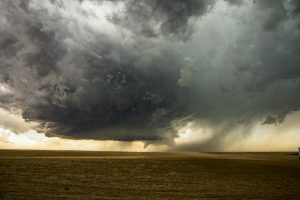 I then moved us into the Hook and watched funnels dancing above our heads but it was not to be with another Tornado on this storm and it started to fall apart quite a bit. Our attention was now drawn to the Tail End Charlie Supercell NW of Limon which had also gained a Tornado Warning, this one would be harder to intercept as we had to cut through the NE Side of the Storm and with it already having reports of Baseball Hail this was going to be fun on I70 south of Deer Trail. 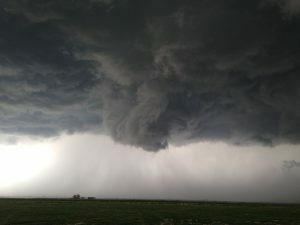 We busted through the Hail to be greeted by a strongly rotating wallcloud near Agate. No touchdown what we could see from our vantage point and the Supercell was getting really HP at this stage, we pushed further South East ahead of the Storm and the structure started to get Insane at this point. The Greens were off the scale with the Large Hail this Storm had in it. We headed east from Limon to Genoa and stopped again for a look at the jaw dropping structure. Tornado Sirens started blaring at this point at 458pm MDT as a Confirmed Embedded Tornado was 4 Miles NW of Genoa. We continued east and stopped a few more times for structure as it looked like everything was growing upscale and congealing into a mess soon. And one more look at that Structure. We finally let the end of the Storms overrun us in Burlington where we stopped for the night. An absolutely incredible chase day which had pretty much everything. Colorado you were Immense today! Started the day in North Platte with a split target today of either Colorado or Nebraska. SPC upgraded the Tornado Risk for Nebraska to 5% and with a stationery boundary and dewpoints in the mid 70’s we selected a target town of Albion as our choice today. We left and grabbed a quick lunch and watched Agitated Cumulus starting to explode all around us. And after filling up the petrol tanks the best storm of the day exploded just 7 miles from us. 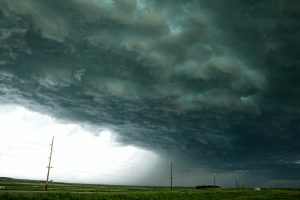 We headed east to watch the storm grow and noted a left split and right mover so headed for the latter, we pushed through Madison and watched as the Storm really organised. 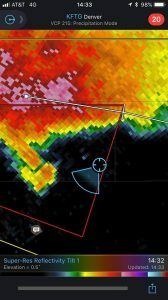 And around 7 miles SE of Pilger the storm gained a Tornado warning, we watched a white cone funnel extend halfway to the ground but no touchdown was noted from our position, we continued on towards WestPoint where the structure really started to take shape. 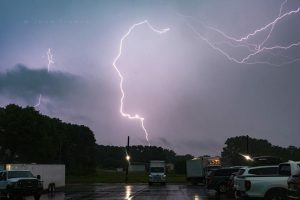 The Storm after this became congealed into the cluster further east towards Iowa so we decided the call it a day with storms that far east and headed back west towards Madison. 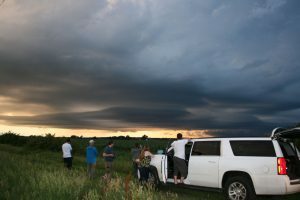 Just before eating at Whisky Creek we watched a lovely LP Supercell at Sunset. We ended the day in Columbus, once again another risk that never really verified or got going today, another chance tomorrow back west in Colorado. We awoke today and started heading South West towards the Nebraska Panhandle, Storms would fire around 3-4pm and hopefully interact with a Stationery Boundary and the SPC put in a nice 5% Tornado Risk Box. 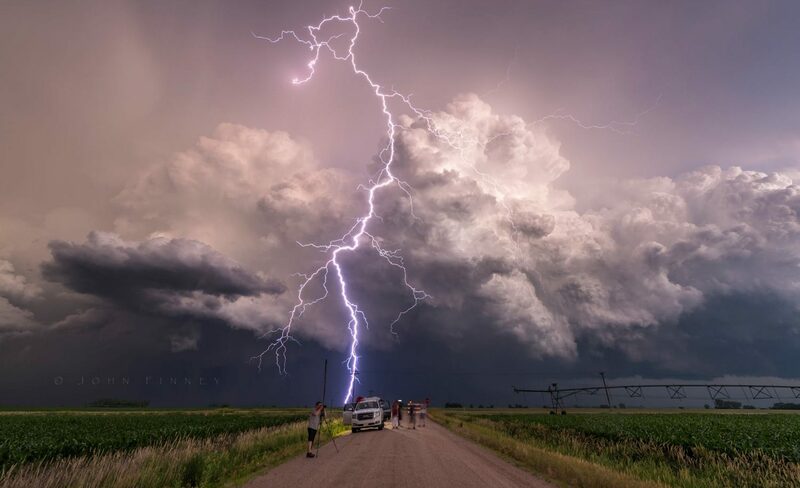 But……This is 2018 and if it can be out of our reach by a few hours it will be and so it was once again, A solitary Supercell fired in the optimum position to ride the boundary but at 1pm (3 hours early) and we watched in pain as the Storm stalled and sat on the boundary gaining Tornado warning for a full 3 hours and producing a few Tornadoes in our target area, as we got towards North Platte the usual happened with lots of clustering of storms. 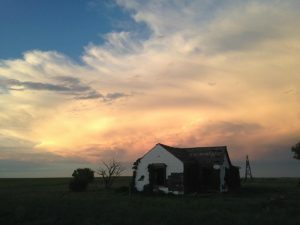 We did get a nice Structured Tornado Warned Storm at Sunset East of North Platte though to salvage the day. The tough season continues………..
We awoke today with another 10% Hatched Tornado Risk in the far NE of South Dakota and Western Minnesota. An Outflow Boundary would be the focus for storms today and with 84/76 T/Td spreads and ample shear it looked like a decent day. We got to the target area of Summit and waited until 7pm with tonnes of chasers in the Car Park of a Petrol Station. 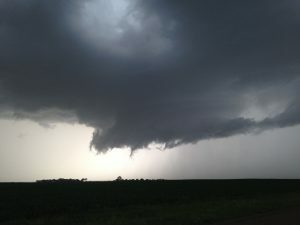 An elevated storm South West of Watertown soon became surface based and so we headed east to Ortonville in Minnesota to plot and intercept course. The Storm came towards us and we noted weak rotation and a small couplet to our South West, dangerous lightning was pounding our position. Small needle funnels were dancing around but we also noted lots of new convection going and up interfering with our storm. And that was pretty much it, the whole area of storms filled in and became a rainy mess, another day of amazing synoptics down the pan. We then headed west to more areas of storms and shot lightning from a hilltop. 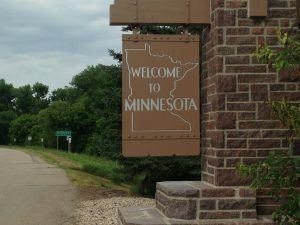 We ended the day in Watertown. After travelling all day from Burlington to Dickinson on the 13th we awoke to a stunning looking Set-Up along the International Border, with a lifting Warm Front, High 60’s Dewpoints and an Outflow Boundary. Most CAM Models were showing a few discrete Supercells in Canada and 1 along the Border, my main worry was moisture would not advect far enough North or that the Warm Front would not get far enough North as well. 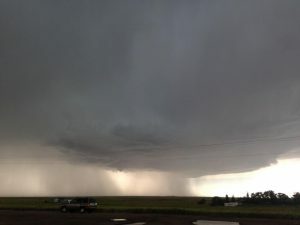 Our first Storm of the Day was at 9am (Yes you read that correct 9am) and a stunning Elevated Hailstorm as well near Williston. We met up with Craig, Dallas and Jock at the Mcdonalds in Esteven and watched what would be an amazing Supercell develop just west of Fortuna which was tracking ENE. 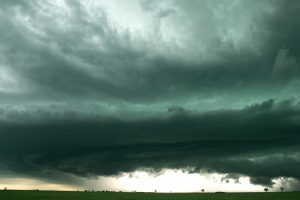 This Storm really structured up with some incredible Green Skies. 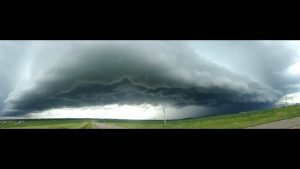 After crossing back into North Dakota we tracked this Supercell for about 100 miles and also watched a few other Supercells but once again apart from Cold Outflow Dominant Storms nothing ever looked close to being a Tornadic Storm, 2018 continues to make us scratch our heads and all risks underperform. Another chance for Storms on Saturday though.